Reading is my coping mechanism – there is no doubt about that and it has been my sole means of escape during the past couple of weeks. Someone told me that I am going through reverse culture shock. But, to be honest, I think that my problem really isn’t culture shock as much as being frozen in fear of the future. After having graduated from college last month, I have become increasingly frustrated by my job search. Throughout my entire academic career, I have found myself a top performer and a top competitor and now, I feel reduced to almost nothing – riddled by insecurity and self-doubt. My family has been extremely supportive. They have taken me on vacation after vacation and have single-handedly worked to ensure that I have something to look forward to each day. But, this time in my life can likewise be characterized by my incessant reading: books about foreign aid in Africa, feminism, the impact of mass media, and capitalism – on top of all of the books I have been reading as a part of my Global Book Challenge. 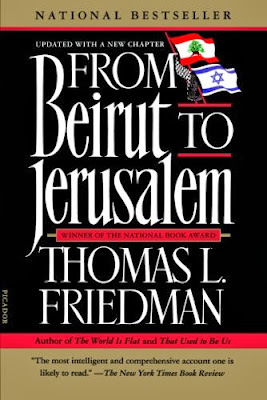 I mention this not to invoke pity from my readers, but rather to introduce a book I read about Lebanon/Israel earlier this year: the winner of the 1989 Book Award for Nonfiction, From Beirut to Jerusalem by journalist, Thomas L. Friedman. I mention this book because I read it as a coping mechanism in a situation, in which I was certain I was going to die. This book was recommended to me as a must-read on the Middle East. 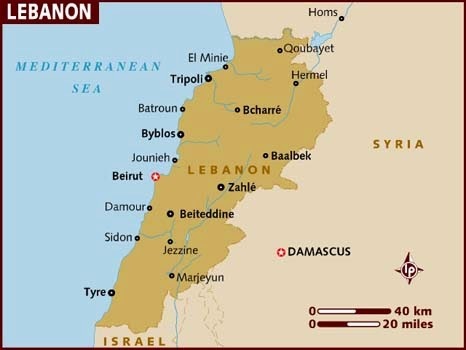 Since my book on Lebanon left a lot unanswered questions in my mind (as it was only an overview) and my book on Israel focused on the start-up business atmosphere, I thought that this would be a good addition to my book blog. I was not disappointed at all when I read this book. It provided me with a much better understanding of Middle Eastern politics, in particular the conflicts in the countries of Lebanon and Israel. One of the aspects which most interested me was the three lenses that Friedman argues we must use in order to understand the politics of the Middle East. The first lens which we must utilize is that of “tribe-like politics” (page 87), exemplified through countless examples in the Middle East, not least of all “why Hafez al-Assad, even though he was the President of Syria, could order the killing of 20,000 of his own citizens. Because on some level Assad did not see the Sunni Muslim resident of Hamas as a part of his nation…” (page 91.) The next lens we must utilize is that of authoritarianism, which the author argues is present in almost all Middle East countries, either in its soft Ottoman-influenced form, as in Jordan or the UAE, or in a more brutal form, as in Syria and Yemen. Finally, Friedman argues that we must view Middle East politics through the lens of the modern nation state, which is a new concept for the Middle East. The author notes that, “Not only were the boundaries of these new Arab states artificially imposed from above; so, too, were many of their political institutions” (page 99), as I read about in my book on Iraq, Inventing Iraq, which documents British influence on the country through the mandate system following World War I. This book is truly a masterpiece which presents a great deal of complex and technical information in a way that is not only enjoyable and interesting to read, but also never seems overpowering. Thus, I encourage anyone wishing to learn more about this region to read this book. However, I will end by mentioning how this book helped me develop a better foundation for understanding the Israeli-Palestinian conflict.